Foster City, unfortunately, has a fair number of second stories added to Eichlers—and a few other outlandish conversions too. The ambience along Beach Park Boulevard (above) is disturbed by a gargantuan add-on. 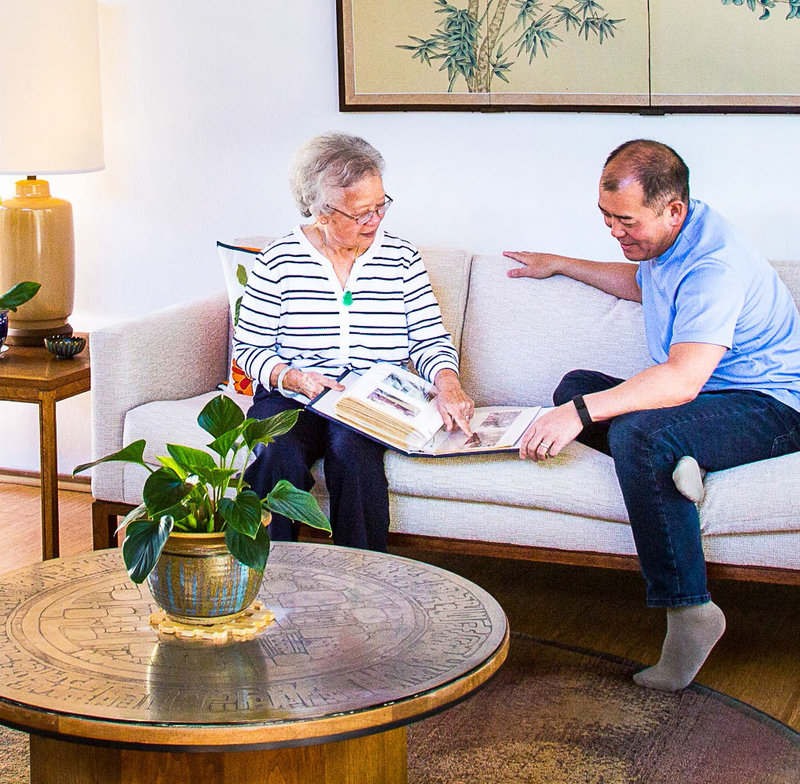 Longtime Foster City Eichler owner Dorothy Matsuo shares her book of family photos with son Kirk. 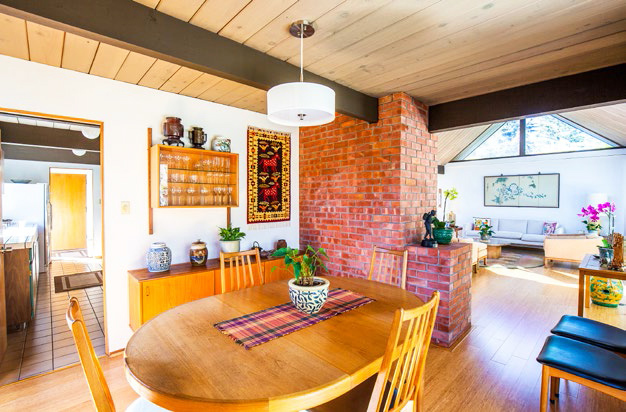 Inside the Matsuo Eichler—graced with lovely Japanese decor. 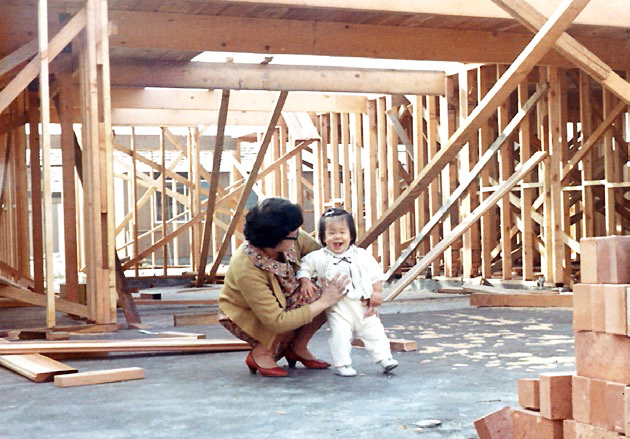 Dorothy Matsuo and daughter Holly during the construction of their Eichler on Mainsail Court, 1967. Today, Glenn Sennett says, houses in Foster City go for less than in some other Eichler neighborhoods, including San Mateo Highlands. Foster City has much to offer, residents say. "The school system is amazing," says Rhoda Andrada, whose son is in elementary school. "Little League is amazing," she adds. Her husband is a coach. Rachel Cross, who has two young daughters and also appreciates the schools, notes, however, that one item called for in the original plan never materialized—a high school. It can take 20 minutes to get to high schools in San Mateo or Burlingame. It's a great town for kids in other ways, she says. "The local beaches around here are really nice. Foster City has just amazing parks for kids everywhere, everywhere you go. Right around the corner is a beach. It's salt water, it's great. We didn't know that until we bought the house. The girls love it." Hiking trails and pedestrian pathways provide bicyclists and walkers alternatives to sidewalks and often connect to parks and small beaches. "There's very little crime," Kirk Matsuo says. "If you're coming here, you're coming here for a reason." But the limited number of through roads causes traffic backups. "You can't get in or out of Foster City between 4:30 and 6:30," says Norm Kirby, an Eichler owner since 1971. Kirby, who like other residents worked at SFO, in engineering and management, regrets that over the years some features called for in the original plan have disappeared. "There used to be lot of little restaurants in small shopping centers, local places to shop," he says. "You could walk and bike there. That was the idea." Dorothy Matsuo, Kirk's mother, is the widow of Kiyoshi Matsuo. Like his friend Roger Chinn, Kiyoshi was a leader in town. He served on the planning commission and city council and as mayor. Kiyoshi "thought the city was well designed," Dorothy says, adding, "As new people come in, part of the city council got new ideas. I don't like what they have done. There are so many buildings coming up." Like some others in town, she blames overdevelopment for contributing to traffic woes. In the beginning, it took both foresight and courage to move to Foster City. "It was all sand," Roger Chinn recalled. "They were still filling then, sand was being pumped in from the bay." It was impossible to open your door with sand blowing in, several residents recalled. Jackrabbits and field mice scampered past. There was also no local government, just the developer. "So we petitioned to form a government. A group of us was unhappy with the way things were operating. We didn't know where our property taxes were going," Chinn says. "It was a very good neighborhood for kids," he says. "People got to know their neighbors. We knew everyone on the street." Ann Huff, who lived in the home that Paul and Rachel Cross now own, remembers a "tight-knit, friendly neighborhood. The Eichler people kind of stuck together, and the people across the street [in non-Eichlers] kind of stuck together."